An emerging queen!! Something we have never seen before. Very exciting!! Then we realized she was damaged. Not good! She was missing her right wing and did not look good in general. 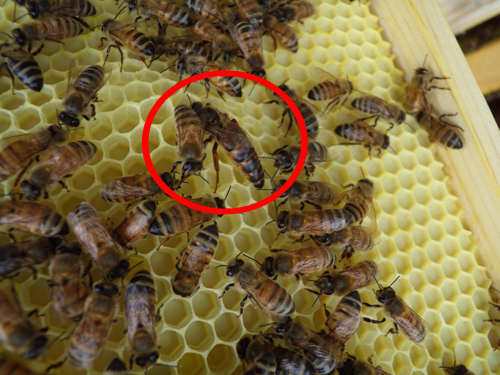 But we have hope, we found about 10 more queen cells in this same hive from the new brood that was laid, so we are pretty sure we will have another new queen within a week. 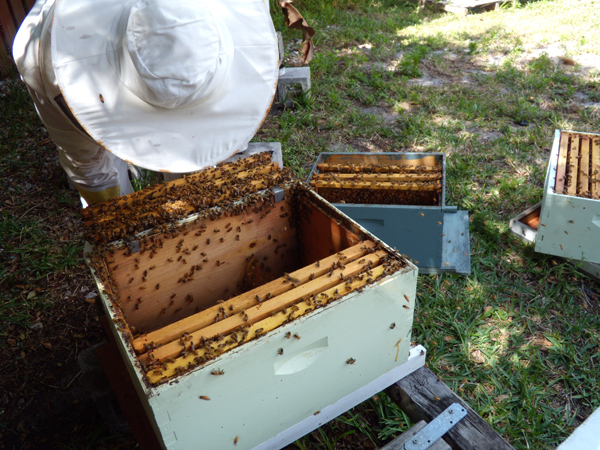 As we continued checking our swarm nucs, we saw some good progress going on. 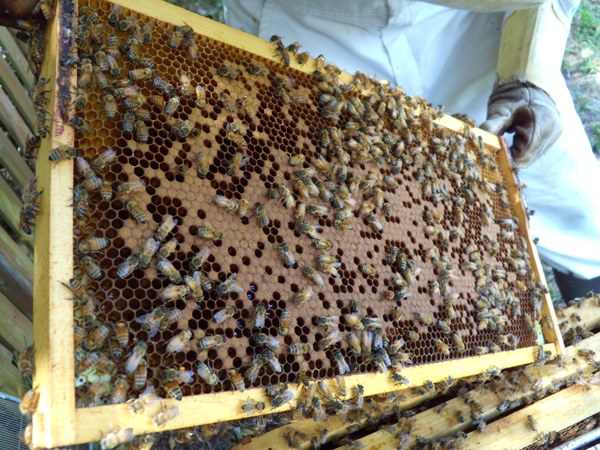 The burr comb we attached to a frame with rubber bands was fully built and already had honey. 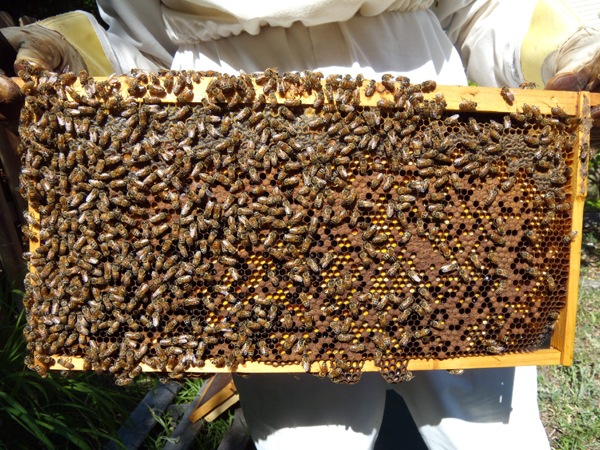 And finally, we saw the new queen of this nuc, very large and impressive. 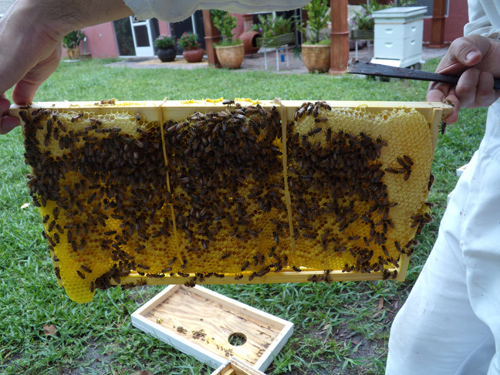 So today we did an inspection of our hives despite the terrible windy and rainy conditions. 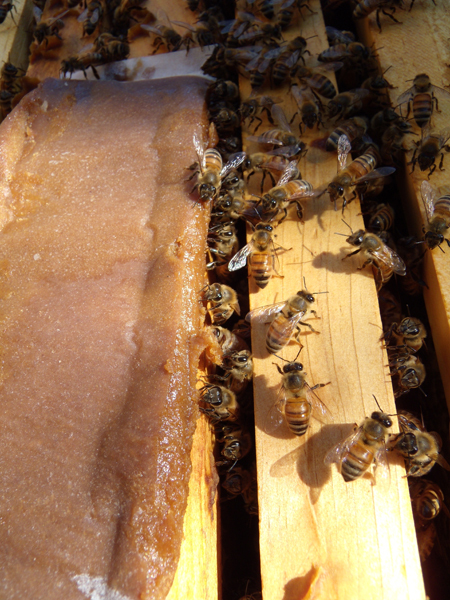 The two nucs that swarmed about a week ago are doing great! 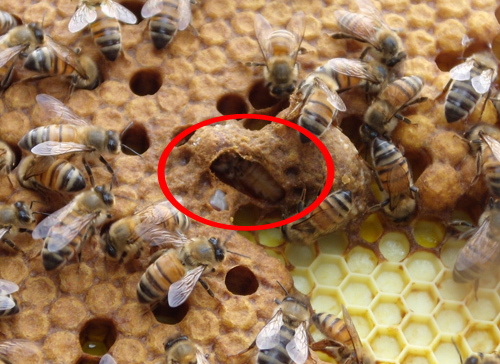 They both have laying queens, we saw lots of new eggs. 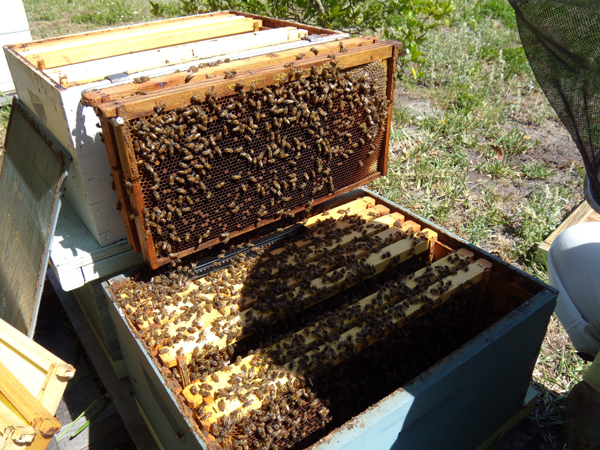 One of the nucs made a very nice burr comb attached to the lid that we had to cut off. 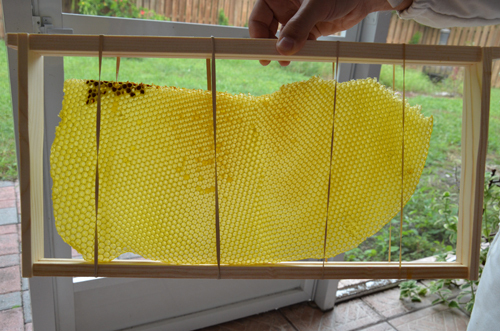 We noticed it was full of eggs, so we attached it to a frame with rubber bands and put it back in the hive so the bees could tend it. 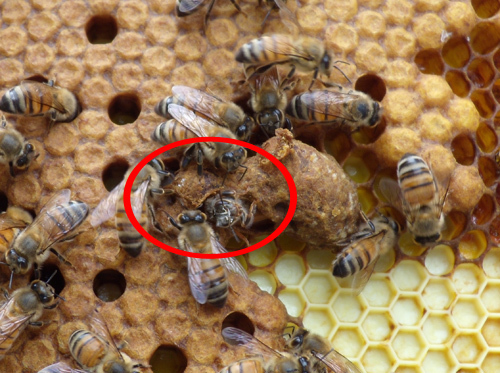 The third nuc that swarmed on Monday is OK. We did not see any eggs, but since it has been less than a week since we caught them the new queen might not be mated yet. We’ll wait a few more days and recheck. 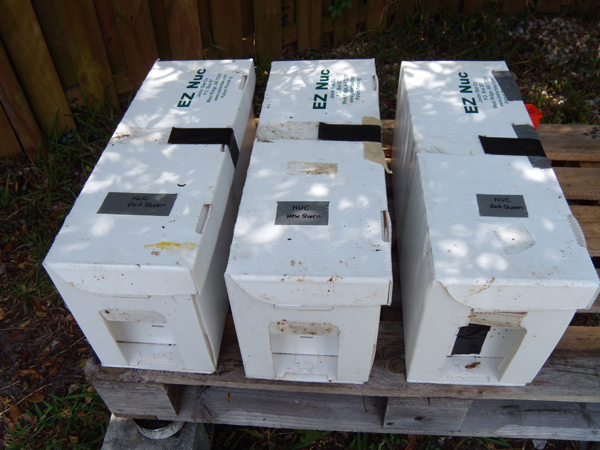 We believe we are going to combine two of these nucs to make a bigger hive, and that way they will have a better chance of making it through the winter. Again? Really!? 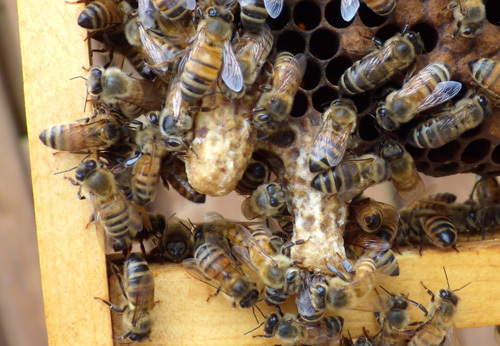 Yup, they swarmed again! 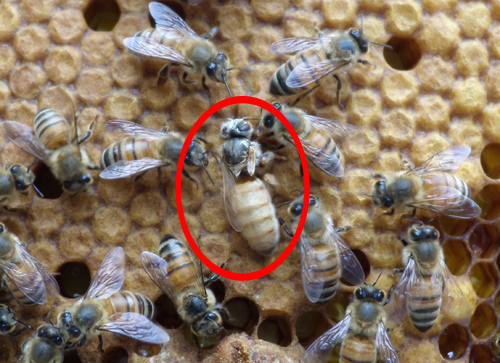 We almost can’t believe it, but yes, the same hive that just had two swarms had a third one! 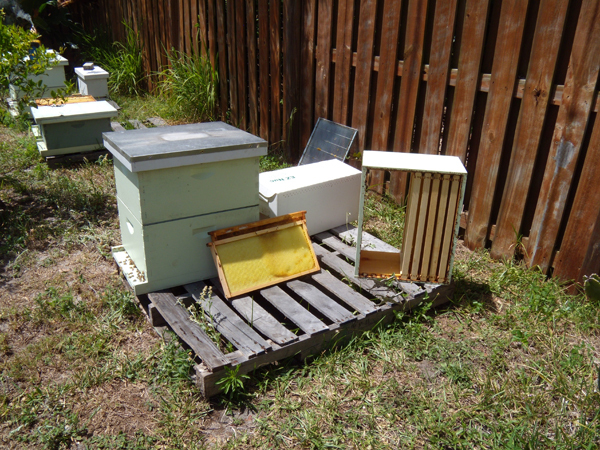 So now we have 3 nucs sitting in our yard. We actually saw when all the action was taking place. 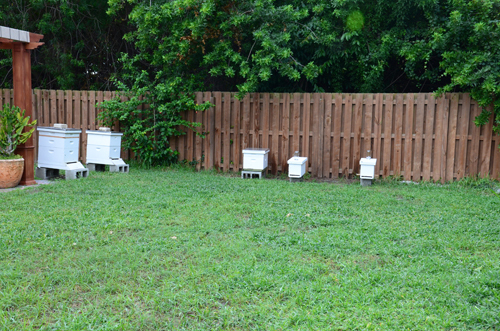 All the bees came out of the existing hive and were flying around our yard, then we saw a large group moving away and towards a palm tree on the other end of the yard. 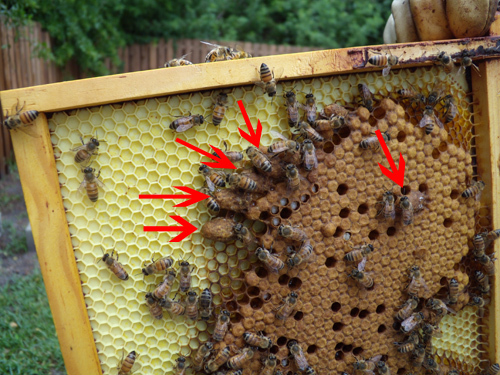 Sure enough that is where they made their cluster and we were able to easily catch them.